Can Packaging and Branding Change Habits? Created to encourage a change in eating habits, Stereotype (by Chinese designer Daizi Zheng) is a series of foods packaged in familiar, yet thought-provoking and disruptive forms. 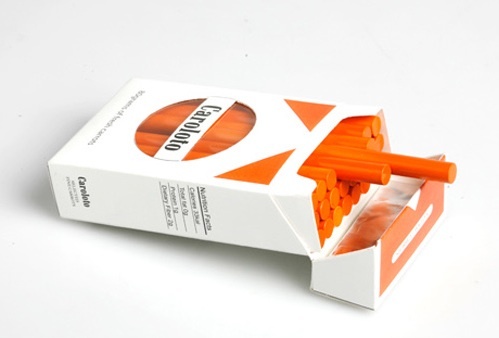 Carrot sticks reminiscent of Marlboro cigarettes, celery served in a fast-food carton and a pharmaceutical blister pack chock full of blueberries are each intended to portray differing rituals and images, connected with our daily lives. But, in an age of expected shock, does a replacing French fries with celery stalks spark any response? Can an academic project evoke long-term behavioral change? Could you become a pack-a-day carrot eater? The work may encourage some to think differently about healthy food, but can branding and design alone change habits? Can the form it takes change or enhance a brand? CPG marketers may want to sit up and take notice during their next new product launch or line-extension initiative. Sometimes the impact that they seek is as close as the next aisle over. Inspiration is all around us. All to often the marketing community does the expected in an effort to remain relevant. Sometimes the unanticipated is just what is needed to build awareness and drive trial, as well as encourage change. Hey buddy, can I bum a carrot? Do You Really Need a Target?